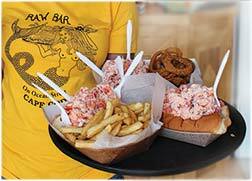 ORIGINAL LOBSTER ROLL voted #1 in New England by TV Diner with Billy Costa! It seems hard to believe but The Raw Bar Ocean Street has been rocking at Hy-Line landing since 2008! The Raw Bar’s original location is in the Popponessett Marketplace in New Seabury, a great little community in Mashpee, on Nantucket Sound. The most memorable and notable item at The Raw Bar is their lobster roll. Billy Costa of NECN’s TV Diner named it the #1 Lobster Roll in New England and that’s a pretty big deal! This delicious dish was also featured on Channel 5’s Chronicle and The Phantom Gourmet. They have a full bar downstairs and on the deck upstairs, overlooking the activity on the harbor. The Raw Bar is the beginning of many island vacations. What are people saying about the Raw Bar on Ocean Street?